The Wilder Group and Compass Concierge provides sellers with up-front capital for market-enhancing, cosmetic home improvements. Our first listing of the year is this beautiful West Oakland townhome. At just over ten years old, the space is modern yet warm, with beautiful wood and metal stairs and light flooding in through large windows. The layout is great – on the top floor, two bedroom suites are at either end of a hallway. The main floor features an open floor plan with a modern kitchen and half bath. A private, attached garage includes extra space for storage and laundry. We’ll be open this Saturday and Sunday 2-4:30. For more info, visit www.1309woodstreet.com. It’s always an honor to help our sellers during their life transitions. Whether our clients are moving to take advantage of out-of-state career opportunities, move-up buyers or are downsizing seniors, we are grateful to support and guide our clients and help show and market their lovely homes at their best. Most sellers need to maximize the sale price because the proceeds of the sale will be necessary for a future home purchase or living expenses, yet few have the funds or time for a complete renovation. Our clients generally expect us to recommend staging and painting, which offer a great return for a relatively low expense. However, not everyone knows that painting other areas like brick facades and fireplaces, exterior trim and cabinets can also transform and modernize the appearance of a home for a fraction of the cost of fully renovating those areas. These lesser known and relatively easy changes give a renovated look that adds value and can result in a higher sale price. 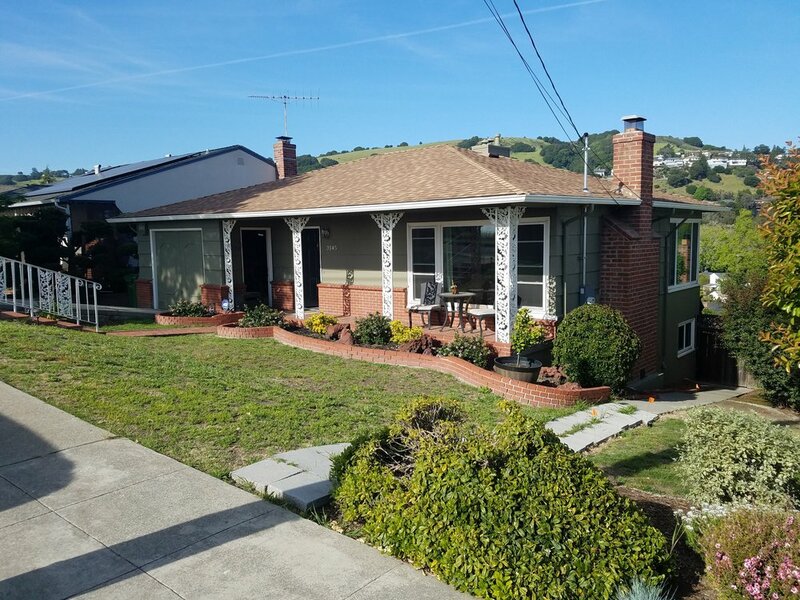 One example was our listing in Oakland's Sheffield Village. The home is lovely and spacious with great kitchens and bathrooms and a sweet backyard and the sellers had made some thoughtful upgrades but they hadn't owned the home for long before an out-of-state job opportunity came along. In order to distinguish their home from the previous time it was listed and add curb appeal, we recommended that the sellers paint the brick facade, fireplace and metal accents around the home's exterior. The results were stunning. After just over a week on the market, three offers came in and the sellers were very pleased with the final price. We also posted this great article on our Instagram about budget remodeling. Many older bathrooms and kitchens can really shine with some inexpensive touches. While minor, these changes can add quite a bit of value, especially for sellers who are hoping to maximize their home’s performance in the market. We love working with sellers to transform their homes. This year has been very full between working with our great group of buyers and sellers and the exciting volunteer work that Farrah does with Realtors locally and at the state and national level. Although we haven’t posted much about it yet, we’ve been very active. Today, we had a quieter moment so we thought we would highlight some of our recent listings since they are great examples of how our relationships and networks are an integral part of our primarily referral-based business. 1460 34th Street. We met the sellers last year when we were selling a similar home just a few doors down. After they reached out, we helped them rearrange their lovely furniture and art to ensure that the photos would shine. Attracted by the larger space, coolness of a loft and convenience of a townhome, four buyers made offers. Just a few weeks later, the home was officially sold. The sellers have moved to a home in the country and the new buyers are now enjoying this great location and fun space. 4141 Piedmont Ave. The seller originally reached out to us years ago but wasn’t quite ready to sell. We kept in touch and she let us know in early 2018 that she was ready. We helped the seller select paint colors and arranged for staging. The gorgeous photos and central location ensured that open houses were well attended. Ultimately, the seller had four great offers to choose from. The new owner works in the neighborhood and we are sure she will enjoy the short commute coupled with the excitement and delightful shops on Piedmont Avenue for years to come. 3145 Middleton Street. While we were sad that our friends were only here for a short time, we were very excited to hear about their job opportunity. The space is generous and the sellers had great furniture and art. Before coming on to the market. We helped them make a few changes and additions, including some strategic painting techniques. Multiple offers came in and the sellers, with help from their relocation company, selected one. With a cross-country move complete, the new buyers will officially take title on Friday. 345 42nd Street is on the market now! The Temescal Street Fair was this Sunday and being so close to Telegraph, we attracted a few visitors who had seen our signs at the festival. This sweet home has so much going for it…an unbeatable location, gorgeous original craftsman details and tons of space (4 beds and 3 baths!). It has been a pleasure helping my friend’s family sell this special home. So far, it’s been a great year! We have so much more to share and will post another update soon! Note - click on each address for more photos and information.